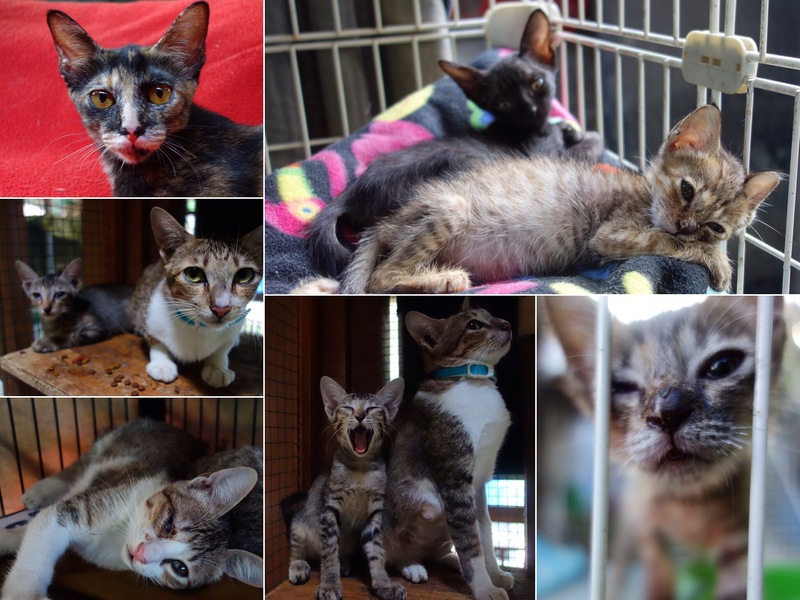 Continued from Indonesia: Part One of Three. and Indonesia: Part Two of Three. 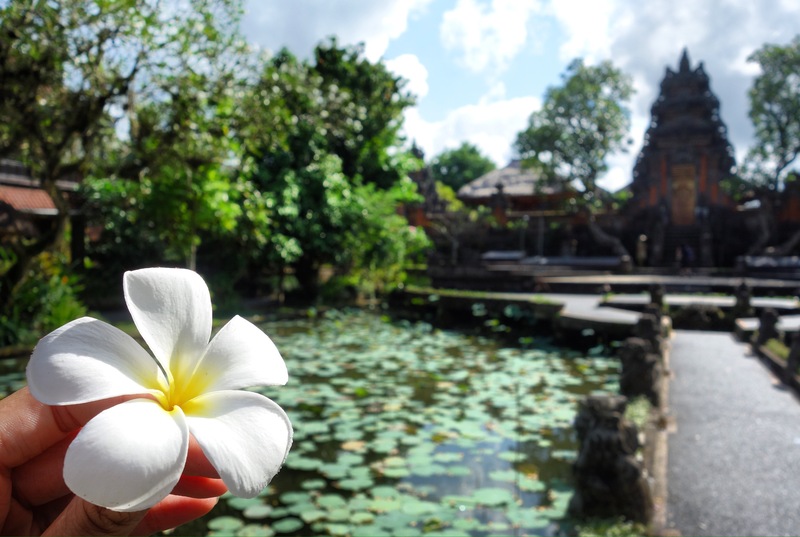 Once my minivan from the port had finally got me to Ubud, it dropped me at Puji Hostel. Andrea would be joining me later that evening, and Sophie and Amy a couple of days later when they finished their Kimodo trip. After dumping my bags, I took the short walk into town where I quite quickly stumbled across a sign saying ‘rice field’ with a big green arrow. The beauty of having nowhere to be is you can choose to wander down these narrow little alleys and get intentionally lost, feeling a little like Alice in Wonderland. 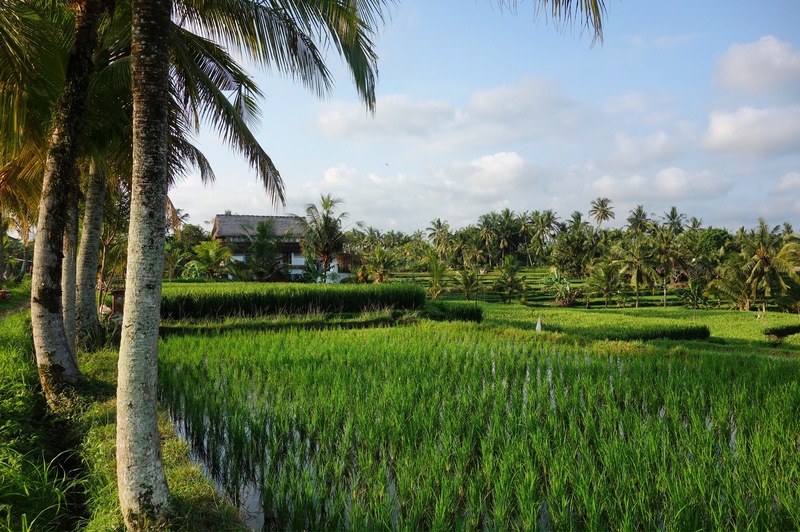 These rice fields are simply beautiful, and a nice peaceful break away from the busy main road. It takes about 20-25 minutes to walk through the fields, but there are a couple of small cafes you can stop by if you fancy a drink with a view. It brings you out at the other end of the road. By chance, I bumped into Andrea and Mel when almost at the other side, so we went for dinner and then said goodbye to Mel as she left to catch her flight. Being away from home for such a long time really makes you appreciate the simple things in life. Like crumpets. Mel was an absolute star and brought us out a packet of English crumpets, and we had a pot of marmite gifted to us by the lovely Lisa when we we were in the States. We did our best job of toasting them in a toasted sandwich maker and then smothered them in butter and marmite; it was easily one of the most exciting breakfasts of the trip and I promise to never take a crumpet for granted again. Andrea and I had been yearning for a ‘nothing’ kind of day where we could chill out and organise our future plans. 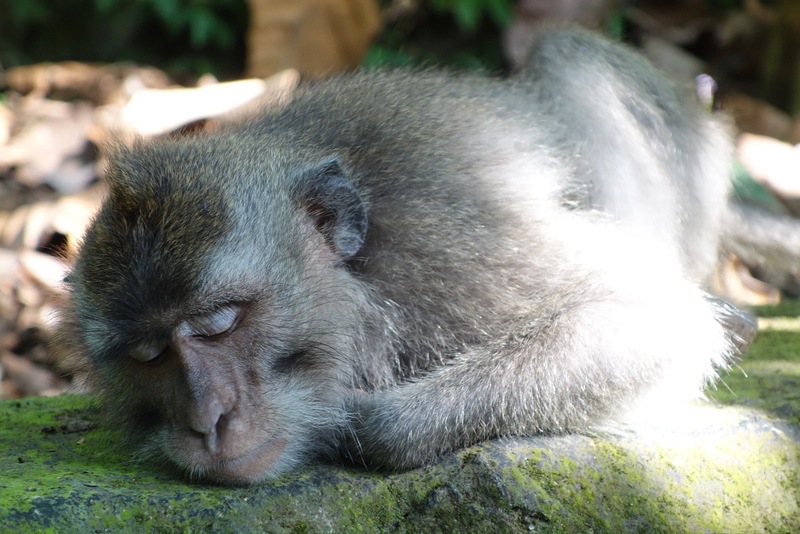 After my busy week on the Gili’s, I finally allowed myself time to crash. I was still having to equalise regularly as my body was obviously confused by being mostly above water again. So, we spent the majority of the day by the hostel pool. Not a bad pool either considering we paid £5 a night. I took time to research the countries I might visit in my time left, write some blog posts and finish a piece I’ve been working on for STA Travel. In the evening we headed into town to grab a bite to eat. Ind recommend veering off the Main Street, you tend to find little gems with much more desirable prices if you do! 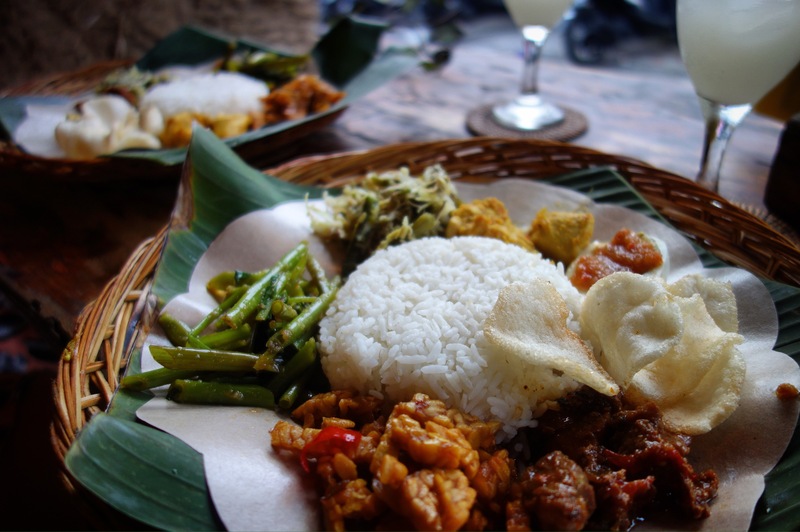 One of our favourites was a small restaurant called Warung Biah Biah on Jl. Goutama. The Nasi Campur was amazing, and a great way to sample a few different Indonesian dishes on one plate. At 23,000 IDR (just over £1), you can’t go too wrong either. The chicken satay and the fried potato things are a great side to order at 18,000 IDR and 8,000 IDR respectively, and why not wash it down with some Indonesian rice wine for an additional 15,000 IDR? Everything is nicely presented on banana leaves, with relaxing lounge music playing in the background. 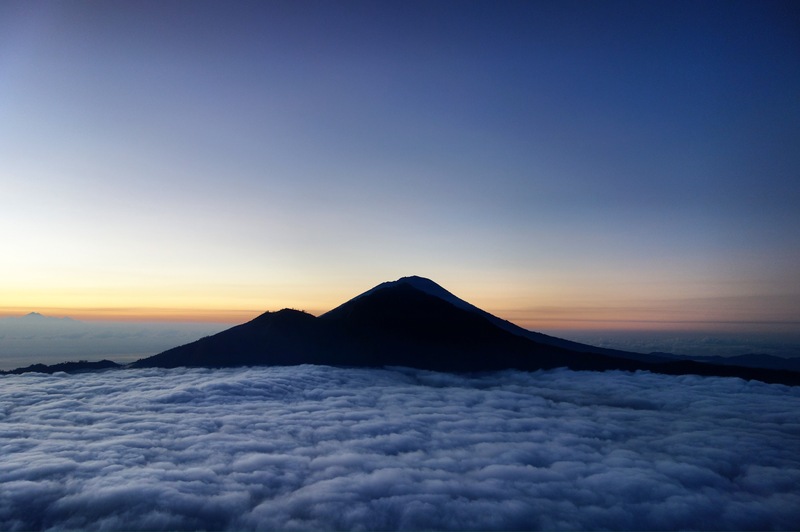 As well as being renowned for its surfer waves and hedonistic nightlife, Bali has a massive health and yoga scene. 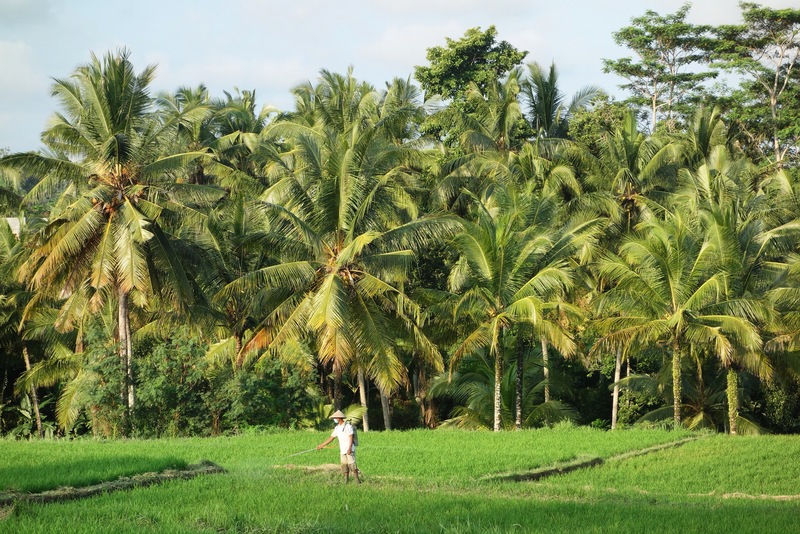 A trip to the centre of Bali reveals a totally different life to the south. Little villages surround verdant rice terraces, and every landscape evokes feelings of peace and tranquility. 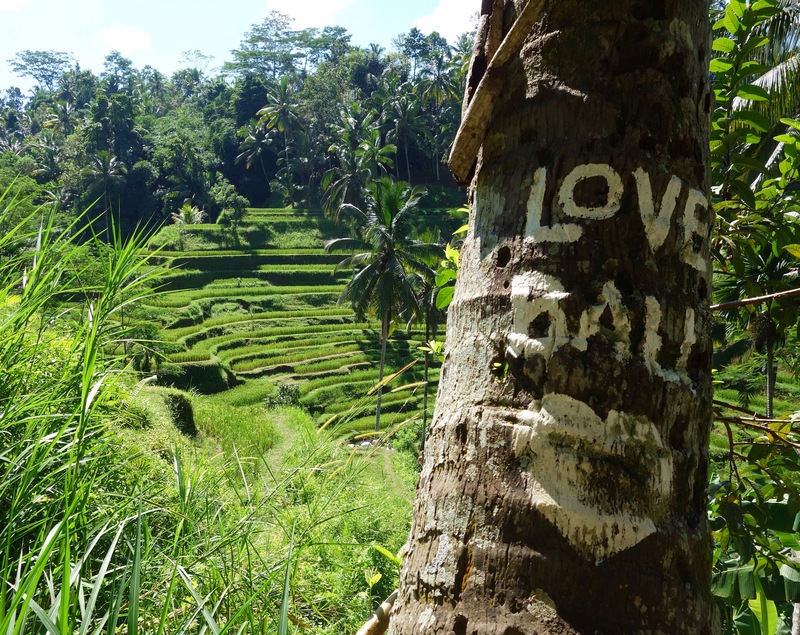 Ubud is the urban centre for this way of life; you can get everything from coconut sugar to a fully cleansed soul, depending on what you’re willing to pay. Yoga studios and shops are in abundance and there are an equal number of massage parlours to help you relax and release some tension. Expect to pay about 70-100,000 IDR for a one hour Balinese massage. You’d be silly not to. That being said… so far, Asia has offered me some very interesting takes on junk food favourites. Some of the most interesting include blueberry ice-cream Oreos (which were disgusting by the way), green tea Kit-Kat amongst other things, Black Forest Dairy Milk, and blue coloured vanilla, apple and blackberry Twister ice lollies. Most of them were nothing to get too excited about, so I need to remember to stop getting so excited and trying everything! Stick to what you know. In the morning Andrea and I visited the lotus pond and temple behind Starbucks. It’s another free activity, and certainly worth stopping by for 10 minutes. Our gentle start to the morning picked up pace when we entered the market street located opposite the Puri Saren Royal Ubud Palace. I haven’t really felt the need or desire to buy souvenirs since we set off in December, but here was a totally different story. With tables piled high and shops overflowing on to the street with beautiful handicrafts, it was near impossible to resist. My now prize possession was definitely an impulse buy – two chunky wooden pineapples that I have to lug around South East Asia for another eight weeks. You can barter VERY hard at this market so never pay the price first offered. A lot of them followed their price offer with ‘but you barter’ or ‘but I give you good price’ so they’re fully expecting you to go lower. Half the fun is haggling and testing your persuasion skills, so enjoy! Amy and Sophie joined us in the early evening, so we all grabbed some dinner together and then we headed to bed as we had a very early start the next morning. We had arranged to hike Mt. 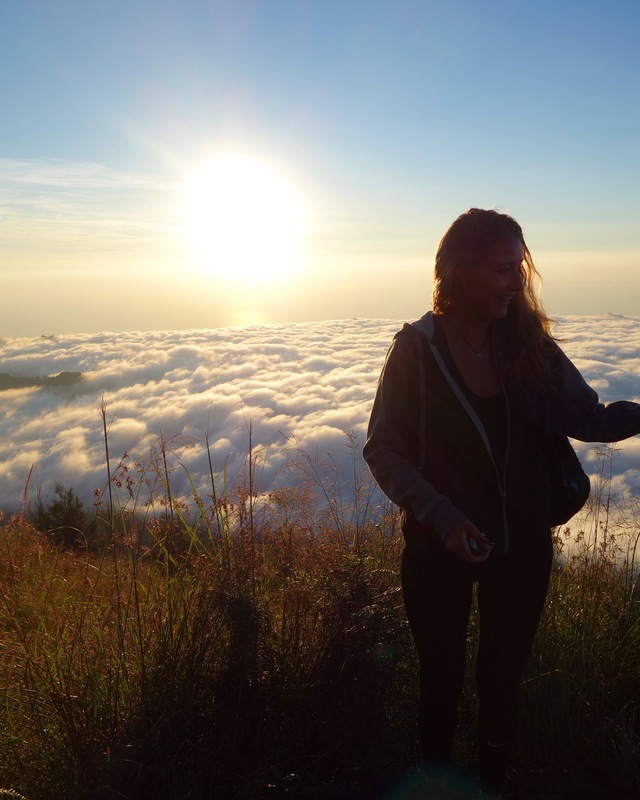 Batur in time for sunrise which meant we were picked up at 2am. 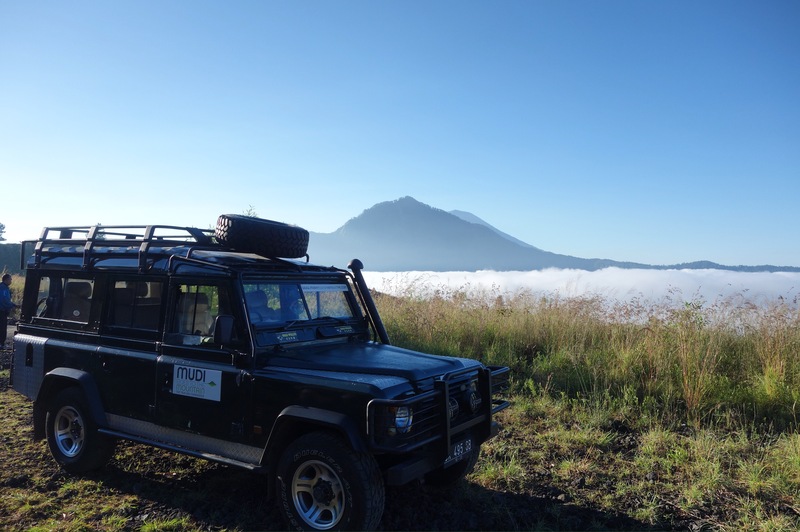 You can book these trips pretty much anywhere and cost 300,000 IDR, although many people said they bargained and paid 250,000 IDR. We booked ours via our hostel and paid 350,000 IDR for an extra three hours of sightseeing including a luwak coffee plantation, rice terraces and a waterfall. 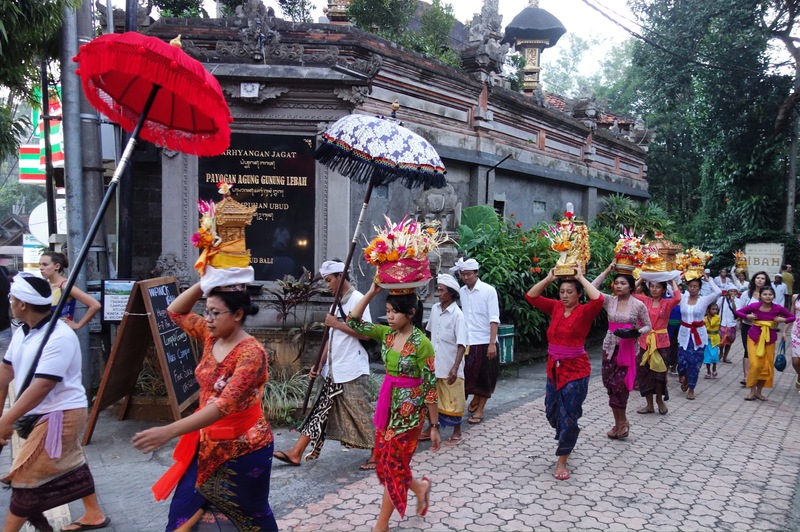 There is no public transport in Bali, so most people hire a car with a driver for half a day or a full day to carry out their local sightseeing. The driver will then take you wherever you want and are generally very knowledgeable about the tourist hot spots. Cost and time wise, our Mt. 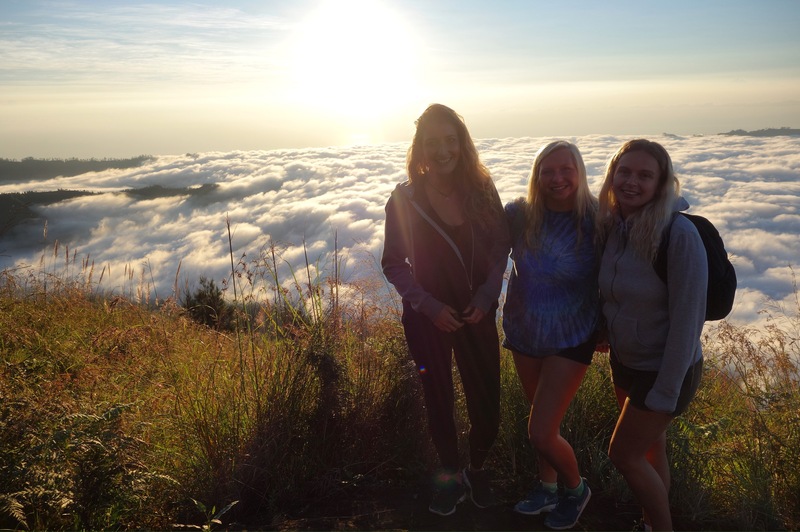 Batur tour worked out better for us so that’s why we combined the two. It takes about one hour to drive to the base of the mountain, and then another two hours or so to hike to the top. Arriving about 5am, we took a seat and waited for our tour guide to cook us a modest breakfast of a boiled egg and a mushy banana sandwich that I didn’t really like but found myself polishing off anyway. With lots of unstable rocks, it wasn’t the easiest of walks, but most of the trek back down is way worse! You basically slide down the steep mountain of dirt when descending from the very top – of course it is dark when you ascend so you don’t quite realise the terrain under foot until then! Watching the sun rise over the clouds is pretty spectacular, it has to be said. When we arrived at the base our driver took us to a coffee plantation where we got to sample lots of different coffees and teas, including luwak coffee for an additional 50,000 IDR (the coffee that’s pooed out by an animal). This was followed by a short visit to Tegalalang rice terrace which was so picturesque and like no other verdant landscape I’ve seen before. The undulating sea of green is like something straight from a postcard. Walking through the narrow path between the terraces, Amy and I managed to step into the rice terraces, covering ourselves in mud and nearly having our flip-flops swallowed by the earth. We laughed our heads off and didn’t feel quite so embarrassed when a man in front also lost his footing and fully tumbled into the muddy water just moments later. By this point we had been up for a good 10 hours, and really starting to lag. We drove on to see the beautiful but overcrowded waterfall, however opted to head home for a sleep rather than stay there and swim. 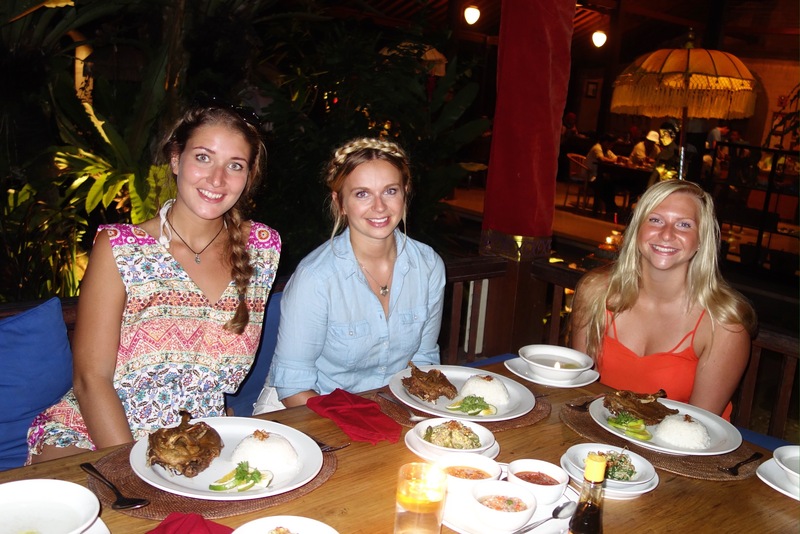 The next day we waved Andrea off as she headed back to Gili T to also obtain her PADI certification. Amy, Sophie and I headed into town towards the Monkey Forest, emptying our purses in a fair few shops and market stalls along the way. The Monkey Forest was actually pretty cool, and like something out of The Jungle Book, just minus King Louie. We even gave hanging from vines a go. Tarzan and the monkeys make it look a lot easier than it is… Most of the monkeys were surprisingly pleasant and providing you don’t have food on show pretty much left you alone. 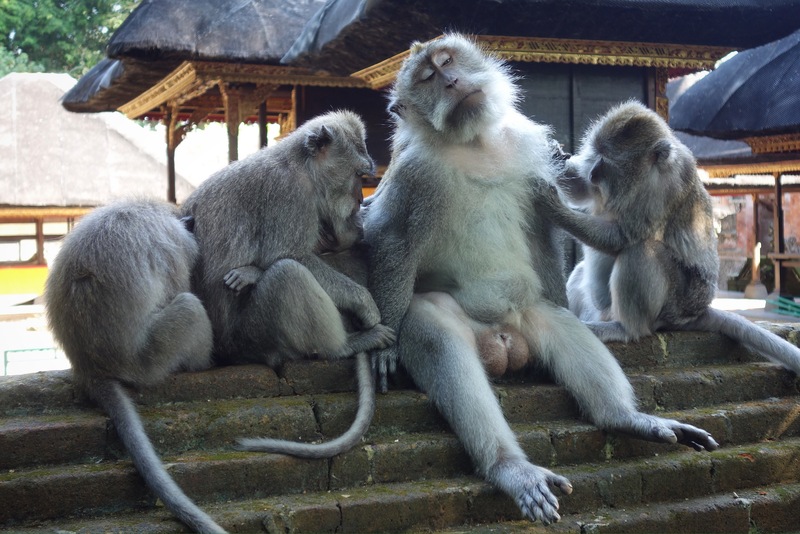 It wasn’t my favourite activity in Ubud but it was quite fascinating observing the monkeys and their creepy anthropomorphic behaviour. An adult ticket costs just 40,000 IDR, so it’s a pretty good way to pass an hour or so. Ubud is apparently famous for its crispy duck so I did some online research to find us the best place to go but also at a reasonable price. I chose Laka Leke, which is a nice restaurant located just behind the Monkey Forest and offers 1/2 a crispy duck dish for 115,000 IDR. The restaurant also puts on traditional Balinese dance shows on Mondays, Wednesday’s, Thursday’s and Saturdays, which saves you paying 80,000 for a ticket to a show at the palace or similar (do add a 25% charge to the bill on the aforementioned nights however). Two birds one stone. We were visiting on a Wednesday but it was just out luck that this was the one night they had cancelled the show! Thankfully there was a workshop for a local school going on so we got to see a small bit of their traditional dance after our meal, and even get a photo with a couple of the dancers. The duck and accompaniments were delicious too, I’d definitely recommend it! After dinner I got a taxi to the airport costing 275,000 IDR. Grab Taxis and Ubers are about half the cost, but unfortunately aren’t very prevalent in the area later into the evening. I was flying at 6am the next morning so decided to save a nights accommodation and sleep at the airport. I arrived around 11.30pm and then made up my bed on the row of seats. It was no 5*, but rucksacks make surprisingly good pillows and towels make surprisingly good duvets. Denpasar airport is pretty modern and clean, with adequate seating, so it certainly wasn’t the worst nights sleep I’ve had on the trip! ← Indonesia: Part Two of Three.